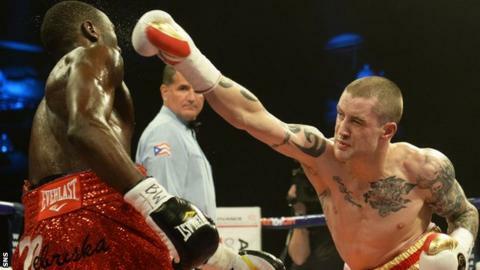 There has been a necessary period of reflection for Ricky Burns. After losing his world title, he was defined by questions about his ability to continue fighting at the elite level and about what remains of a career that reached unexpected heights. The Coatbridge boxer was left to contemplate the limits of his options. Immediately after his defeat by Terrence Crawford in March, when he relinquished his WBO lightweight title, Burns asked for a rematch. His promoter, Eddie Hearn, gently steered the conversation towards different possibilities. Crawford had been the superior boxer and Burns had to come to terms with his own diminished standing. There was no element of shock - even though Burns has always been a durable and reliably competitive fighter - because the signs of decline had been evident. Burns only overcame Jose Gonzalez when the Puerto Rican quit on his stool because of a broken hand suffered while testing Burns to his limits. He then retained his title with a draw against Raymundo Beltran that even the most patriotic of Burns' supporters recognised as a home decision that was unfair to the challenger. Burns is only 31, though, and has never succumbed to excesses outside the ring. He is naturally fit, a committed trainer and is dedicated to his sport. A career will always wane in the end, but Burns can still stop his sliding towards also-ran status. It is that recognition that prompted him to move away from his trainer, Billy Nelson, who oversaw his development to world-class level, in order to work with Tony Sims, whose Essex gym also accommodates Kevin Mitchell, the British lightweight, and Anthony Joshua, the heavyweight prospect. Sims has a close working relationship with Hearn and assisted Nelson in Burns' corner during the defeat by Crawford. A change of personnel can be invigorating, but it was telling that Hearn made reference to Burns working away from home. Having married his long-term partner, Amanda, and become a father, there might be a sense of domesticity impinging on Burns' professional life. He will always be wholly committed to the demands of training, but on the surface, it appears that Burns has lost something of his edge. It could also be attributed to the broken jaw he suffered against Beltran, which required a titanium plate to be inserted, and saw Burns often hunker into defensive mode, as if protecting his head, in the Crawford fight. Hearn might have preferred a more measured rebuilding of Burns' status. Confidence could have been regained in low-key domestic bouts before a return to the world stage and Sims has a reputation for being a technically-minded trainer who could have refreshed the style of a boxer who has always been adept but relied on courage, durability and the intensity of his work rate. Burns, though, had no intention of returning to the British scene. He remains convinced he can win another world title and his fight with Dejan Zlaticanin in Glasgow on 27 June for the WBC international lightweight belt is an eliminator for the WBC title currently held by Omar Figueroa. Zlaticanin has not performed at world level yet and is considered a one-dimensional fighter who will seek to engage directly with Burns, which will suit the Scot's more mobile style, although he is a southpaw like Crawford and cannot be dismissed as carrying no threat. Burns is also likely to revive his effective jab once he has spent time working with Sims. There is, then, potential for Burns to revive his career. At the same time, though, defeat would leave Burns out of touch and contemplating a final run of fights against British opponents that would, at least, generate some decent income if not the prestige he craves. As Hearn has starkly pointed out, this is a last chance for Burns to prove himself capable of competing for world titles. He will be refreshed now and eager to recover his status. He also knows what is at stake now and can no longer imagine that the run of improvement and victories will continue. Burns has limits and he has now found them. The challenge is to find a way to ensure he can still achieve his ambitions before those limits constrict further. The need is for a world-class performance against Zlaticanin - and not just for Burns himself. Scottish boxing needs him to still be prominent, to still be bringing high-profile shows to Glasgow. Hearn has put together an intriguing undercard, but it is reflective of the current state of the Scottish scene that the local interest focuses on Willie Limond - the 35-year-old who is in the final stages of his career - facing Curtis Woodhouse, and Stephen Simmons, who is 29 but still establishing himself in the professional heavyweight ranks. Burns should not be written off. Victory ought to be within reach against Zlaticanin, but there is no more room for error. There have been glorious nights in his career and occasional setbacks. Burns now has to prove that he can rediscover the old certainties.